A 0dB configuration designed for every-day office work that supports up to 3 monitors. [No data for higher environment temps yet]. [WARNING]: The only shortcoming of CPU cooler CR80-EH is that it allows ONLY ONE memory stick with regular profile. Possibly, a low profile memory would fit but I haven't made a try. So, why choosing such a cooler when more space efficient form factors are available? The mobo in the Thermattake V1 is mounted horizontally and Coolers like CR80-EH or CR-95C work better in this conditions because they don't have a (strongly) preferred flawing direction for warm air. This favorites natural air convection with no active fan (I don't have a single active fan). The hum of the fanless Seasonic 400 is barely audible and this is a huge pro to me. The new 8th gen i3 makes the PC very responsive with its 4 cores (even if compared with my previous i5-7500). I consider i3-8100 one of the best choices for a mid-low budget PC. In conclusion, this configuration satisfies the needs of a decent every-days duties PC without producing any audible noise. 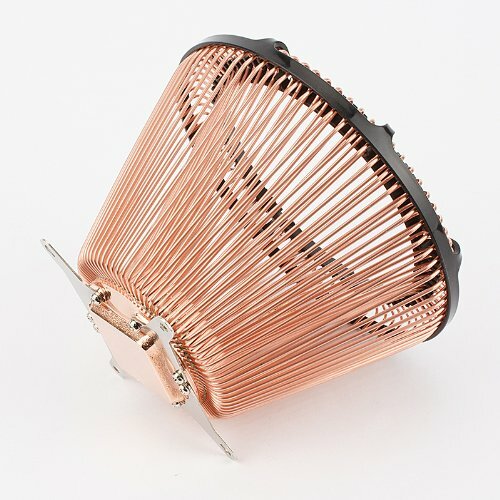 PROS: A good CPU cooler with a proper form factor for horizontal mounting. It can handle a i3-8100 TDP without the help of case fans. CONS: It's huge and it might create problem with ram sticks. In my case, I could mount only a single memory stick. In comparison with other coolers such has Cooler master H110, its more difficult to mount. A very feature rich mobo including wifi and bluetooth. A fanless PSU with platinum certification at a reasonable price. PSUs circuits normally produces a hum. In the case of Seasonic 400, hum is barely audible and this is a huge pro for a funless device, which is supposed to be quite! It really is an awesome build for its intended use. I'm surprised OEMS don't try using NoFan coolers with their office PCs they sell. The cooler is so big that I couldn't install a second RAM stick. So, pay attention if you intend to use this cooler with a Mini-ITX mobo. I use low profile DIMMs and they fit fine into both slots on the AsRock Z270 Fatal1ty ITX/AC motherboard I built with this case last February. This is really cool. I didn't know fanless PSUs were a thing before this build. The more you know. NoFan has a 400W power supply and it has no hum at all. Absolutely silent. Can you fit a GPU on the PCI-E slot? Yes. I've got an NVidia GTX 1060 in there. Thanks, this build has been very helpful to me, I can see myself doing a similar build soon. Also, you seen to have swapped the left and right side panels on the case. Well, the pictured computer is actually not mine (I'm not the original poster, but rather a random commenter) — but yes, with this case you can swap the three panels (top and sides) at your discretion. Does your PC use the same motherboard and CPU cooler combo? were did you get the cooler? Does the motherboard not have an M.2 slot? If it does, why not a much cheaper 500GB WD Blue M.2 SSD? Just saying. Would've helped on cable management and still been cheap. Sorry for this super late reply. You are right. For most cases this configuration is a 'bit' oversized.